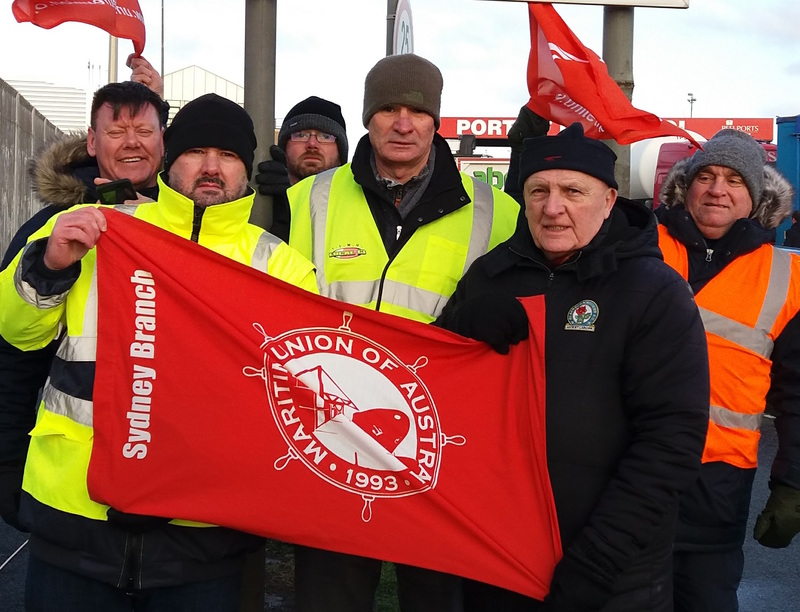 Dock workers and lorry drivers joined forces at the port of Liverpool on Friday to protest over the lack of decent welfare facilities for those employed by Peel Ports. 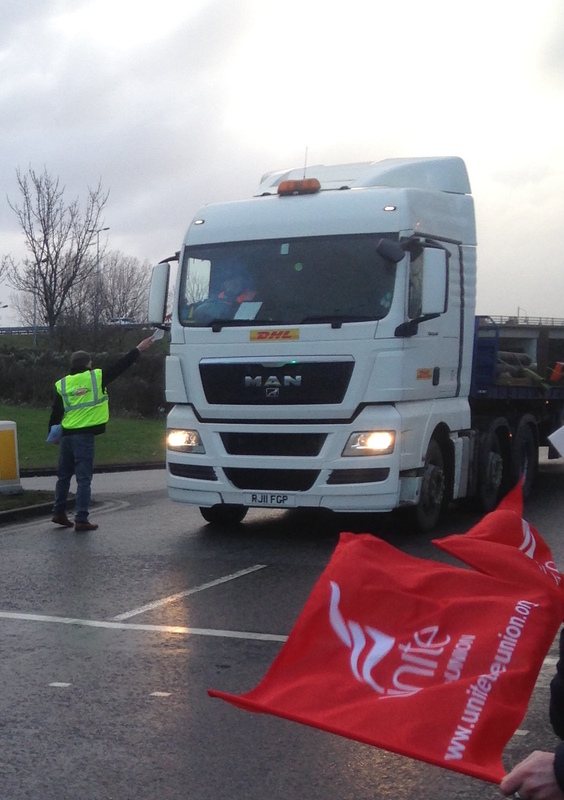 Members of Unite the union, who have piloted the ITF/IndustriALL hubs programme across the UK, are angr y over the lack of basic provisions at the port – things like clean toilets, rest areas and canteen facilities. More than 800 dock workers and lorry drivers are impacted by the poor conditions. Unite is calling for urgent talks with Peel Ports management to address the problems facing workers at the port and to provide decent facilities for all workers who visit. This is an example of the hubs programme in action with two groups of workers who could remain in their silos, talking to each other and identifying common problems so they can get their voices heard more effectively. 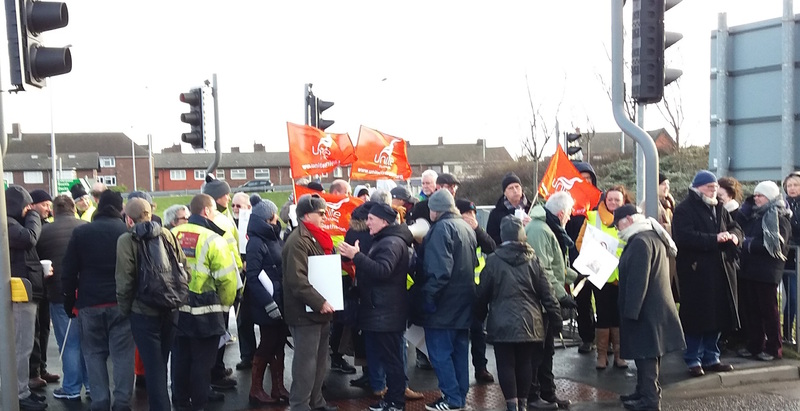 Unite regional officer Coli n Carr said: “Dock workers have raised their concerns about the inadequate welfare facilities on site whilst lorry drivers find intolerable conditions when faced with delays in accessing the port. “Peel Ports is investing millions of pounds on transforming the port of Liverpool – making Seaforth the ‘dock of the future’. Yet, although our members are contributing in making this a reality, behind closed doors the company is treating its dedicated workforce badly by having scant regard for their wellbeing and welfare at work. The IndustriALL/ITF industrial hubs programme has been featured during IndustriALL’s congress in Brazil this week. Here’s a report direct from Rio…. #OurHubs is an organizing project run jointly by IndustriALL and the International Transport Workers’ Federation. It uses hubs – such as the port of Grangemouth, or Panama airport – as bases bring unions together across supply chains. A side meeting on the project was held at #IndustRio2016. It was introduced by Tony Burke, assistant general secretary of Unite the Union. He explained that the hubs project is about strategic organizing and building workers’ power across supply chains. Mark Lyon of the International Transport Workers’ Federation (ITF) explained that the project is a cooperation between the ITF and IndustriALL Global Union, working with affiliate Unite. The pilot hub has been at Mark’s home town, the port of Grangemouth in Scotland. Grangemouth is surrounded by a complex network of companies and organizations, including an oil refinery and chemical plants. Grangemouth is also used to export whisky, which is a major contributor to the Scottish economy.There is a coordinated transport and logistics network encompassing a very complex supply chain. There are weak links in the supply chain, because companies rely on lean production and just in time delivery. Most of these workplaces are well organized by different unions, but there is not enough coordination between workplaces. Mark said, “I worked in an oil refinery for twenty years, and I was a union activist. We worked with tanker drivers who were organised too, but in twenty years we never spoke to them. Sharan Burrow addressed the meeting, and spoke about the crisis of corporate greed. The weakness of unions across the world has been exploited by corporations who are driving down terms and conditions. In the worst instances, this has resulted in modern day slavery, such as in fishing supply chains in Thailand. IndustriALL assistant general secretary Kemal Ozkan gave a detailed explanation of how complex supply chains interact with each other, and how strategic organizing can be used to build workers’ power. By coordinating supply chain organizing, unions in a position of strength can create organizing space for workers who are under pressure. For instance, the oil and gas industry can be divided into upstream, midstream, downstream and transport and logistics. The hubs programme was piloted in Grangemouth, Scotland, but is being developed at a number of key industrial sites across the world, using the coordination of IndustriALL and ITF affiliates across the world. So far, unions working together in the hubs project include Unite, RMT, Nautilus and the GMB in the UK, SIPTU in Ireland, Ver.de in Germany, Industri Energi in Norway, BTB and Transcom in Belgium, FNV in The Netherlands, USW in the US, and the transport and ports affiliates of the UGTA in Algeria. Rob Johnston of the ITF explained that the project was a proven success in the UK: the next step is to make the model work in the developing world. The project is working with a number of Algerian affiliates to make this happen. Get more from IndustriALL’s congress.